What does your book pile say about you? Last year, I read some terrific books including – The Natural Way of Things; All the Light We Cannot See; People of the Book; One True Thing; A Man called Ove; Of a Boy; When There’s Nowhere Else to Run; The Marriage of Opposites; Donna Quixote; La Rose; Where My Heart Used to Beat; View from A Barred Window to name just a handful. I’ve listed twelve titles randomly and realise that six of them are historical fiction. My list consists of seven Australian authors, six of whom are women. Interestingly, of my list of twelve, nine are by women. Many have won awards and two are self-published. I do like to read historical fiction. In fact, I like it so much that I wrote and published my own historical fiction. Now I’m in the middle of writing a second novel set in Northern Greece during the Greek Civil War. I confess I’ve only just recently realised this about myself. I always thought I read widely – perhaps not widely enough across genres. There’s three written with the Second World War as a backdrop; five set in Australia; one in the US; one in Europe; one in Sweden and one in the Virgin Islands. Perhaps I like historical fiction because I like history? I’m not a history buff but I do like to learn about historical events through story. I like being transported back in time and place. I guess that’s what draws me. That, and of course, a well written book which is probably written by a woman set in Australia. Is that called unconscious bias? Too bad if it is. 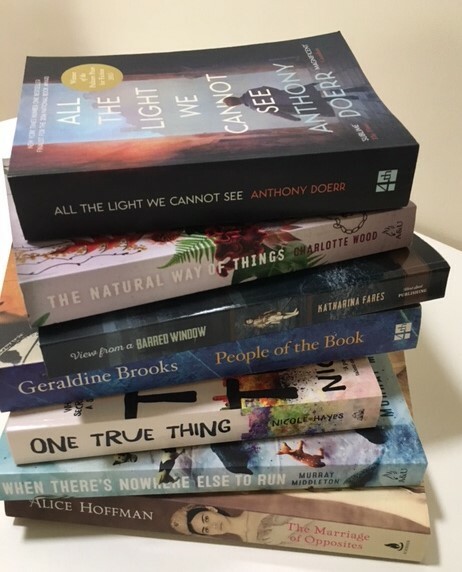 I enjoyed each book in my list of twelve but if I had to name a favourite for last year, it would have to be All the Light We Cannot See – that’s one I’ll read again and again. As for what I’m reading currently? You guessed it – another historical fiction called Beauty is a Wound set in Indonesia but it is written by a man. What does your book pile reveal about you ? This entry was posted in Writing and tagged books, books by women, historic fiction on January 6, 2017 by S.C. Karakaltsas. Well done Sylvia with the reading. Reading definitely improves my writing – no matter what it is. Oh, and the Husband’s Secret. I’m definitely not the target demographic for that, so I suppose that counts as adventurous! It’s amazing how the list builds. Mine reveals I like horror novels and weird stuff. Apparently that I’m a writer, as well, due to all the non-fiction style guides. Great post, and great blog! Excellent and thought-provoking post. I live on a diet of crime novels, preferably Nordic crime. I just love Hjorth & Rosenfeldt, Roslund & Hellstrom, Jo Nesbo, Stieg Larsson, and am now trying Arne Dahl plus many other crime writers. I think I just love the chase, the tracking down of the bad person. Not long ago I did divert and really enjoyed Me Before You by Jo-Jo Moyes which was completely different. Probably the most important thing is the people and their relationships. As far as writing goes I’ve written a memoir, a fantasy novel, and two children’s books – with a few bad guys in all of them! Thanks for reading and your feedback. I enjoyed Stieg Larsson and Jo Jo Moyes too. As for writing, you’ve been very busy. I wish every success.